Wonder if they will sell these or if they are merely being made for the B-Man. WOW Bono!!!! That looks so awesome!!! FINALLY!!!! 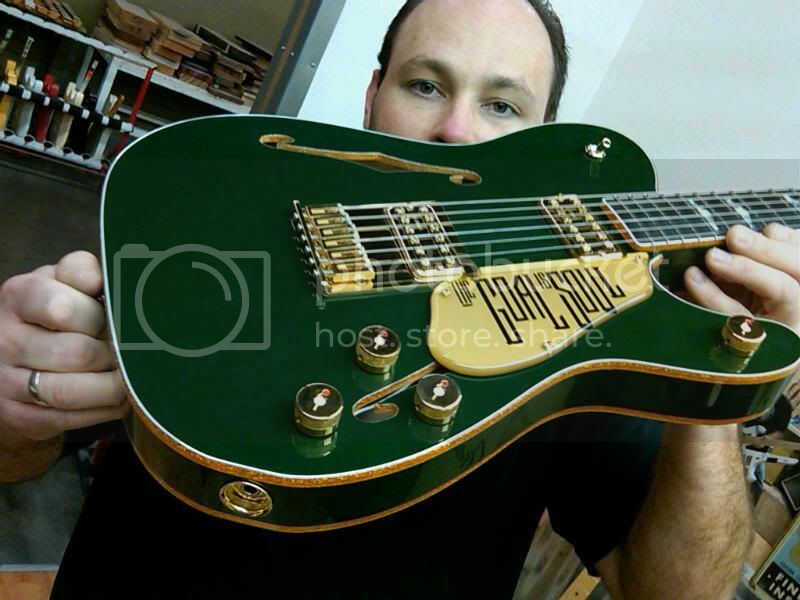 A new guitar for Bono that ISN'T a Gretsch Irish Falcon, however its still the same colours/pickups etc. I just now saw that and came over to see if it had been posted yet. Should have known Edge-0 Tele's are the hubby's favorite guitars, can't wait to show him this. Nice Guitar, but isn't it more or less a fancy stage prop?, Bono plays V little Guitar as we know, except for maybe when he wants to strum along to One, (with the volume turned up) I thought the Falcon looked great and really suited Bono, But anyway nothing to get too excited about as we'll probably barely hear it, unless it's handed over to THE EDGE! When I talked to Dallas last summer, he'd said that he found Bono a Telecaster in NY and that Bono had been playing a lot more guitar while they were working on new songs in the studio. I've heard that they ceased production of the Irish Falcon in 2010. And perhaps Bono was ready to move on to something new... or at least somewhat different. make a hybrid to suit. 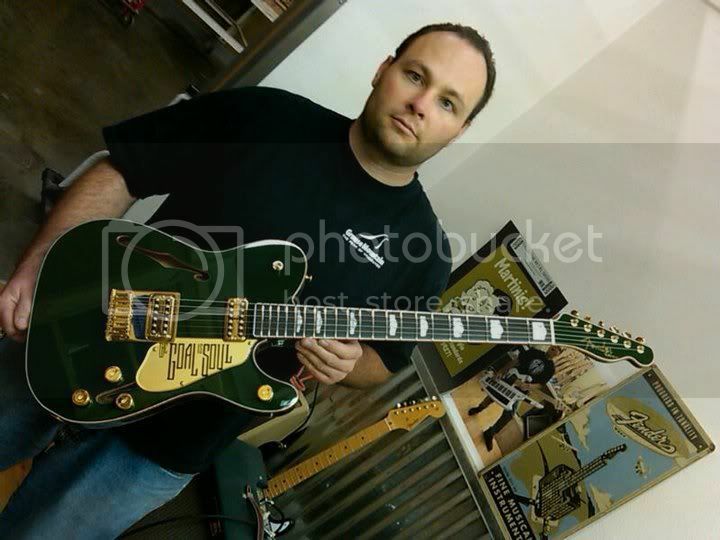 Here's the scoop... Paul Waller is the guy who makes these guitars. It was basically his idea to combine some features of a Gretsch (the pickups, the f-holes) into a Tele. He built a white one about a year or so ago as a prototype. I'm not sure if Bono has that one or not. From what I was just told, it seemed like the idea for this guitar was Paul's, and then Bono somehow heard about it and/or saw the prototype guitar. But, in any case, yes, the green one is obviously for Bono, and it's just now getting ready to ship. Bono plays a lot of guitar in the studio. Danny Lanois has said that he likes Bono's guitar playing and that he comes up with interesting ideas. Dallas mentioned that Bono's been playing a lot of guitar while in the studio writing. True Bono has played less guitar during the last few tours. That might be more due to the design of the stage and wanting to connect with the crowd more as a front-man. No one is saying he's great... Bono wouldn't say that either. But Bono's guitar playing is far better than most give credit. Love the guitar! I just hope Bono knows that if you're going to hold a tele... you better be actually playing it. Very interesting, especially to hear the pups in a Fender. Is this the first Thinline Tele for any of them? Can't think of any Thinline Tele that Edge has and uses? Mick, from Unforgettable Fire, put FilterTrons in a Telecaster of his and it sounds great. Of the guitars seen in studio pictures, video and stage... seems to be the first thinline that Bono or Edge have obtained. But if you think back to the picture of The Edge that was in "Q" magazine, of him sitting in the storage room at Hanover Quay... there are a lot of guitars. There are some that we've not seen. Example: Edge owned the Stratocaster used for "Stuck In A Moment" well before 2001's 'Elevation' tour. 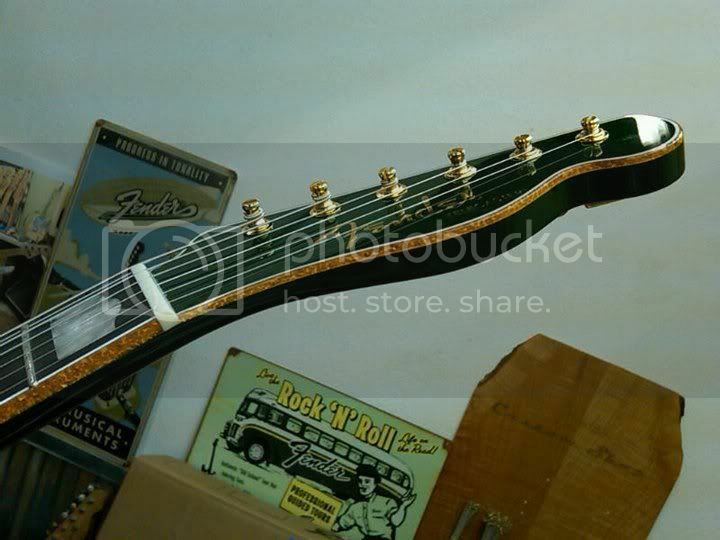 In fact, it can be seen on a stand in some pictures from the Point Depot 'Rattle & Hum' sessions. It's vintage. Edge promised to not bring it on tour. He felt that guitar was THE sound of "Stuck..." so it went out on the 'Elevation' tour... but it's not been seen since. Hopefully, it was not one of the guitars destroyed in the studio flood. Bono had a red 1972 Telecaster along during the Popmart tour but he didnt' play it during shows. I've seen it in pictures of his guitar locker from the Popmart tour. During Joshua Tree tour, he had a custom made Telecaster style guitar made by Danvel / Nelson. Danvel / Nelson was the company that made the Stratocaster style guitar Edge can be seen playing during "...Streets..." on Rattle and Hum. (the one with the matching black painted headstock and rosewood fingerboard). Bono also used a Telecaster Custom for a few shows. Bono's guitar playing improved this last EU leg anyway, he now plays parts of Bad, thogether with Edge , and has this new intro thingy during One in wich you can actually hear him play! And its sounds suprisingly good, especcially the last performance Bad , or the part Bono played in Brussels, is great. Someone has been practissing guitar in a hospital bed and I applaud him for it. That thing looks weird in a cool way. Good to see he's looking for some other things than a Gretsch. Ummm... the new guitar is part Gretsch. Yes , part .. Not just Gretsch, did I say it wasn't ?